The ex-husband of a woman who was awarded 230,000 on her divorce has been told by the Court of Appeal he must support her for life. Maria Mills, 51, was originally awarded 1,100 a few months from 50 -year-old Graham Mills after 13 years of matrimony. Appeal Court reviewers also governed he should pay her 1,441 per month as she is “unable to meet her basic needs”. 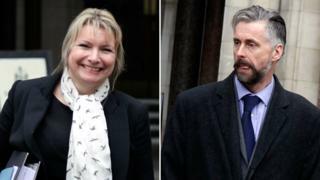 Mr Mills had argued he should not have to “pick up the tab” 15 years after the couple split. Lord Justice Longmore and Sir Ernest Ryder discovered the couple even married 1988, had a now-grown-up son, separated in 2001 and divorced in 2002. Mr Mills, a surveyor, had agreed to give Mrs Mills, a former Notting Hill estate agent, almost all their “liquid capital” when they divorced, while he remained his business. His barrister, Philip Cayford, told the court Mr Mills, who now lives in Guildford, had now been remarried and wanted to “move on” with his life. The court listen Mrs Mills had made some “unwise” property assets, moving from a house in Weybridge to a flat in Wimbledon, and then to an suite in a luxury Victorian manor block in Battersea. After selling the Battersea flat she was left “without any of the capital”, the court was told, and was now living in a rented home in Weybridge. Mrs Mills works for two days per week as a attractivenes therapist, the court was told. Frank Feehan, representing Mrs Mills, said she had been left with the responsibility for the couple’s young child and without enough fund to buy a residence that she considered “good enough”. He said his client was “unable to meet her basic needs”. In the rule, Sir Ernest said Mr Mills had the ability to acquire the increased maintenance “until a further order of the court”.